When thousands of human beings and cattle were swept away in Nepal and Bihar after the eastern embankment of the Kosi was breached on August 18, 2008, Bihar’s chief minister, Nitish Kumar, an electrical engineer by training, did not say a single word about dismantling the Farakka Barrage. The Farakka Barrage was not directly responsible for that colossal tragedy. The breach took place because, according to the Justice Walia Commission, the Bihar government engineers undertook the anti-erosion and flood protection work in a shoddy manner and wireless messages were ignored by the government machinery. A decade later, nobody has been punished even though, in Nitish Kumar’s own words the‘pralay’ (doomsday) displaced 33 lakh people and devastated hundreds of villages and towns. Nitish had never in his four-decade-long political career so forcefully demanded the de-commissioning of Farakka Barrage. True he had raised the issue of floods at a very appropriate time, that is, almost four months before the onset of monsoon. In fact, he first sought dismantling of the Farakka Barrage after the waters of the river Ganga entered several villages and localities of Patna in August and September last year. The magnitude of this flooding was nowhere near the 2008 devastation which affected seven districts. Ironically, when parts of western Patna were inundated, it was not raining in the state capital. Once again, Patna was flooded not because of Ganga water alone, but because of the sudden release of water from the Bansagar Dam in Madhya Pradesh and subsequently from the Rihand Dam in Uttar Pradesh––both on river Son, which flows into Bihar and drains into the Ganga on the western outskirts of Patna. Bihar protested the sudden release of the water after heavy rains in MP and UP. It was then that Nitish made the first public statement against Farakka Barrage, which no doubt aggravates the flood situation in Bihar. Most experts agree that the siltation caused after the completion of construction work in Farakka Barrage in 1975 have raised the river-bed of Ganga, and thus increased the possibility of floods. But they ask as to how can the Farakka Barrage be decommissioned? How would it be dismantled and where will the rubble be thrown? How can a technocrat chief minister ignore the needs of the NTPC Super Thermal Power Station situated there? What about the environmental cost? Moreover, Farakka Barrage is situated just 16.5 km from the Bangladesh border and its removal would have international ramifications too. River hydrology experts from Bihar and Jharkhand like Dinesh Kumar Mishra, Ranjeev and Anil Prakash have been writing and campaigning against big dams and barrages. They are also of the view that the proposed dredging of the Ganga for National Waterways-I is not an easy task and will have its ecological impact. As two wrongs do not make one right––first construction and then dismantling of Farakka––they ask why Nitish is not talking about 181 more dams and barrages on the Ganga and its tributaries, which too are causing floods––along with the haphazard construction works. 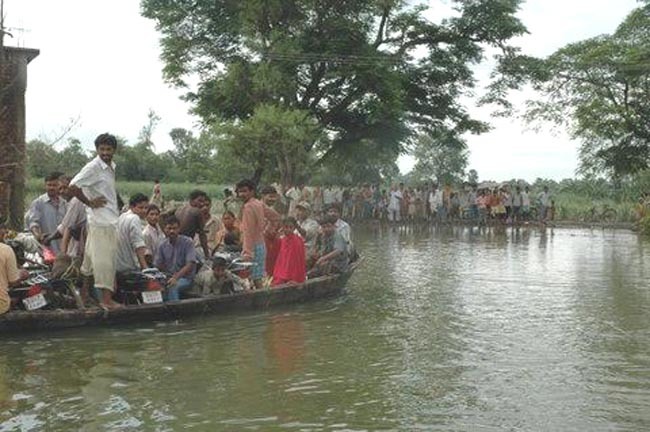 Critics in Bihar opine that Nitish is not serious about the flooding issue. If so, he would not have planned the construction of huge commercial and residential complexes on the reclaimed Ganga in west Patna, which is flood-prone. But Nitish seems to have made a climbdown when while inaugurating the two-day Incessant Ganga conference on February 25 in Patna. He said the conference was not meant to press for decommissioning the Farakka Barrage but to discuss how to rid the Ganga of the heavy silt to ensure its incessant flow. Nitish chose the occasion to take a dig at PM Narendra Modi for neglecting Ganga–and that too in his own constituency––but the Bihar CM’s critics see politics in the latest move. “He largely ignored the experts from Bihar and Jharkhand but went on to invite scientists, environmentalists and social activists from India, Nepal and Bangladesh like ‘Waterman’ Rajendra Singh, Vandana Shiva and Bharat Jhunjhunwala to get national publicity and promote his political cause,” said Ranjeev, author of the book Jab Nadi Bandhi.